Enjoy working on your ride? Considered a set of quality ramps? Then check out our 2018 best car ramps buyers guide. When repairing or servicing your car or truck at home, most projects will require you to raise your vehicle a few inches to give you a better view and allow you access to those hard to reach areas. To maintain the vehicle, you will often have to access the underside. This can be done just using car jacks but this can be awkward and unsafe. There is also no need to buy an expensive garage lift, as a car ramp can be trusted to do the job for a fraction of the cost. You can easily make oil changes, flush or drain the radiator or complete other maintenance, saving you time and effort. There are many types of car ramps available from low profile to heavy duty, depending on the size of the vehicle and what type of automotive repairs you want to make. Headlamps looking a little dim? Our best headlight bulb guide is written just for you. 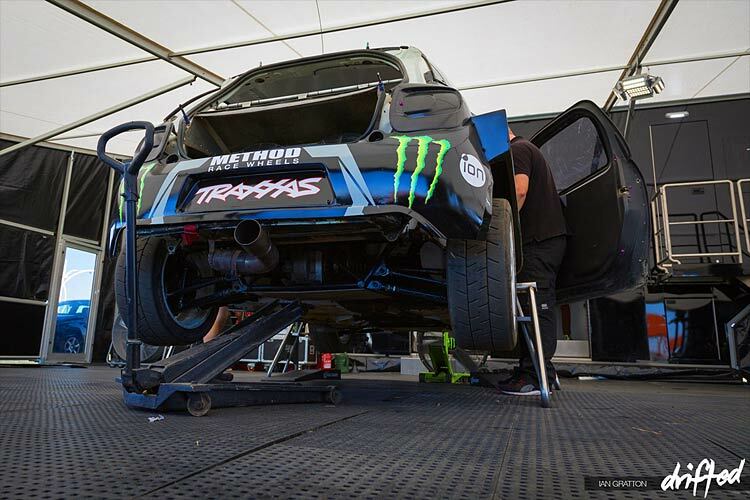 Therefore, it is paramount that you choose the product most suited to your car’s weight or you may put additional strain on the ramps or damage your vehicle. So, to help you navigate through this crowded market, please refer to our comprehensive car ramp buyers’ guide below. The products are all available to purchase from Amazon. 1. Ground clearance: Not every ramp is suitable for every car. You must ensure that it can fit under the car without scratching it. Low profile vehicles, such as sports cars, race cars, and sedans need ramps that are longer and lower, so you gradually drive onto them, without scratching the car’s undercarriage. Similarly, high profile vehicles require high profile ramps, which are shorter. 2. Car weight capacity: Car ramps often have weight ratings, so if your automobile is light, then most ramps will fit it. However, if you put a heavy car on a lightweight ramp, then you may break it and place yourself in danger. The load rating for most products is between 6000 and 10000 pounds. The weight capacity of car ramps is the maximum weight that they can safely support. Manufacturers show this on their products but the specification may vary as some car ramps state the single axle rating instead of the Gross Vehicle Weight (GVW). In this case, you will need to know the weight of each axle on your car before choosing suitable ramps. Generally, the front axle is heavier than the rear because the engine is at the front of the car, leading to vehicle weight bias. But regardless of the rating used on the car ramps, you must never exceed the weight capacity because you will not only damage the device but you will put anyone working on the car at risk. However, the Gross Vehicle Weight rating does not mean that the ramps will hold all that weight but that they are designed to lift and hold up one half of a vehicle that weighs that much. Therefore, a 12000 GVW rating means that the devices will hold up to 6000 pounds for the pair. Conversely, a single axle rating means exactly what it says. For example, a 3000 pound single axle rating means that the pair of car ramps will raise up to 3000 pounds safely. 3. Car ramp inclination angle: One you have worked out the weight load of the ramp, then you should also check the angle of lift. Low slung cars will need a low profile ramp with a small lift angle. Car ramps for higher profile vehicles, such as trucks and SUVs tend to have steeper inclines. 4. Quality of construction material: Whether the device is made of metal, foam, rubber, plastic or wood it will have various advantages. It is important to select the best material because it has a bearing on the durability, weight, portability and storage of the product. 5. Width of car ramps: Please ensure that the ramps are wide enough to accommodate your car tires and leave a few inches on either side. So before choosing the car ramps, you will need to measure the width of the tires. This will give you a margin for error and will reduce slippage when you are loading your car onto the ramps. 6. Surface of car ramps: The surface of your chosen device should provide enough traction for your vehicle to enable you to drive up the ramps whatever the weather and terrain. A smooth surface will lead to slippage, even if the ramps have a low incline. To combat this problem, you can opt for a non-slip ramps, which feature punched plates for extra traction. So, if you want to use them in snowy or wet conditions, then you should choose this surface. The staggered, serrated holes on the surface of these ramps offer optimal traction for automobile, whatever the inclination angle. 7. Ease of use: The ramp should be simple to use. It should slide smoothly beneath the tires and be easy to remove. The best products are also easy to carry and maintain. 8. Price and warranty: Even if the car ramp is at the high end of the price range, you should still consider it, as the more expensive option will have more features. A decent warranty from a reputable company is also essential. But make sure you choose a car ramp that is built to last. Remember, safety first when using car ramps! You must never use them on an unstable surface or an incline of more than around five degrees and use another support device. There is only a small margin of error, so the ramps need to be positioned correctly, or your vehicle may go off the edge. Always put the brake on and use tire chocks to stop the car from rolling back off the ramp. Unless you are using non-collapsible car ramps, then it is advisable to place jack stands (a tire with a board across it) or another device beneath the vehicle to provide extra protection. This will prevent injury to yourself or others, if the ramp were to collapse with someone under the car. When driving onto the amps, use a smooth throttle. It is not advisable to put your foot down, as you may drive over the edge of the ramps. The ramps may even shoot back under the vehicle and damage it. It may help to use the parking brake alongside the throttle to keep the car from lurching forward. So, now that you know what to consider before buying them and how to use them safely, please take a look at our review of the best car ramps for 2018. 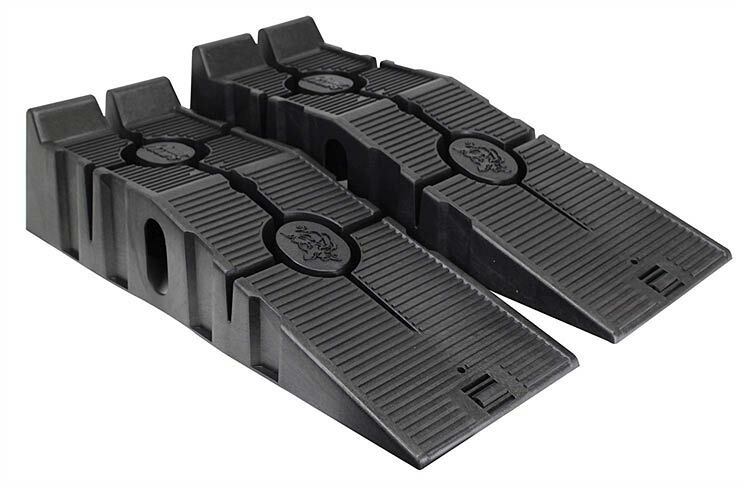 This set of two low clearance vehicle ramps from the highly respected manufacturer Rhino Ramps incorporate a patented polymer internal core support, therefore, they are tough and built to last. They are designed to handle loads of up to six tons, which should be sufficient for most personal vehicles. 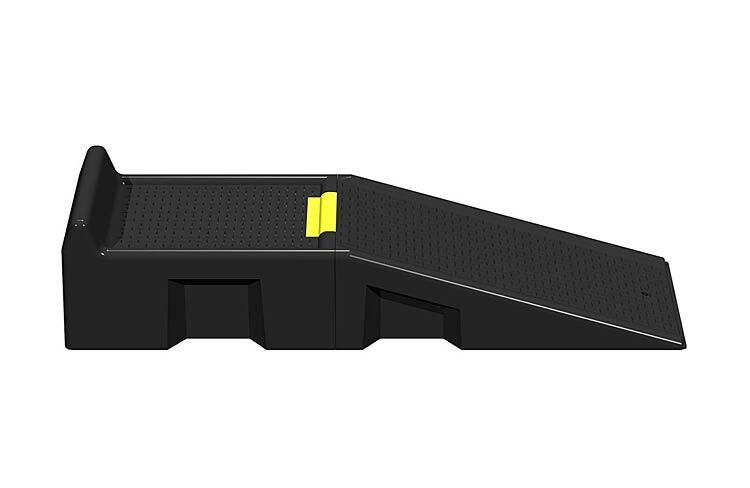 The ramps feature a sophisticated CoreTRAC tread pattern and non-skid base to reduce slippage, keeping them stable on most surfaces, except sealed concrete and epoxy coated garage floors. In this case, you can always invest in a couple of floor mats to put underneath them, to give more friction. The weight of the vehicle will prevent the ramps from slipping off the mats. They are ideal for cars, SUVs, vans, and trucks but they are not suitable for high clearance vehicles. Their inclination angle of 17 degrees means they will elevate your vehicle 6.5 inches off the ground, so you can easily fit an oil drain pan underneath to change the oil. So, you can quickly change the tires, the oil or do other vehicle maintenance. They feature a wide stance for maximum stability, have excellent weight distribution and proven strength. The Rhino Ramps are of high quality and meet the Portable Automotive Lifting Device (PALD) standard and they are a best-seller due to their affordability. They are easy to store away as they nest together, saving space and despite their heavy build, they are very portable, so you can take them with you or keep them in your car. However, they are not suitable for use in extremely cold temperatures, as they flex and crack and they are not UV protected. But if you store them in your garage or workshop, you will get many years out of them. These sleek and simple twin ramps are designed for sports cars and are recommended by petrol heads, car clubs and racing organisations. They have a smooth angle of inclination, making them perfect for low profile vehicles, such as: BMWs, Corvettes, Jaguars, Mustangs, Porches, Cadillacs, minivans and pick-up trucks. If you want to reduce the approach angle even further Race Ramps also offer a range of Xtenders. They have a strong and lightweight construction, giving them a solid core with no holes or hollows and ensuring durability, even if you overload them. The ramps are made using a high density expanded polystyrene foam and then sprayed with a hybrid polyurea coating to increase their strength and protect them from automotive chemicals. They have a firm and safe grip, making them non-slip even on ice. Race Ramps are very compact and remain stable and are not prone to collapse like other plastic models. They can be used on most flat surfaces, including: grass, sand, dirt and are suitable for most tire widths, even truck tires. Their innovative two-piece design allows you to remove the extended incline part of the ramp that you drive up. Therefore, you can access the underside of your car from the side without the ramp getting in the way. They will lift your vehicle up to seven inches high and have no sharp edges, so will not damage your garage floor. Race Ramps are easy to use even for first-timers and the integrated straps at the end of each ramp make them easy to lift, carry, position and store. They do not rust and will not be damaged if you leave them outside in bad weather. These high quality solid steel heavy gauge ramps are much tougher than their plastic, foam and wooden rivals. They feature a powder coated black surface, which not only looks stylish but protects them from the elements. This durable finish also prevents corrosion and wear and tear on the devices. Measuring in at 35 inches long, they also include side rails, so you can reverse your car onto them safely. The punched holes on the ramps and wide trail give excellent traction, when coupled with wheel chocks. Nicky Nice ramps are not designed for low profile cars, as they are quite high. These lightweight but sturdy plastic ramps are suitable for small and medium-sized cars. Their solid and tough construction features a parabolic arch running through the centre. This unique addition enhances the strength and weight distribution of the base. Cleverly designed to reduce slippage by including an open grid pattern on the ramps, they are perfect for snowy and wet conditions, as water, snow and dirt will just seep through. There is also little surface area on the ramps for particles to collect, so you can safely leave them outside. 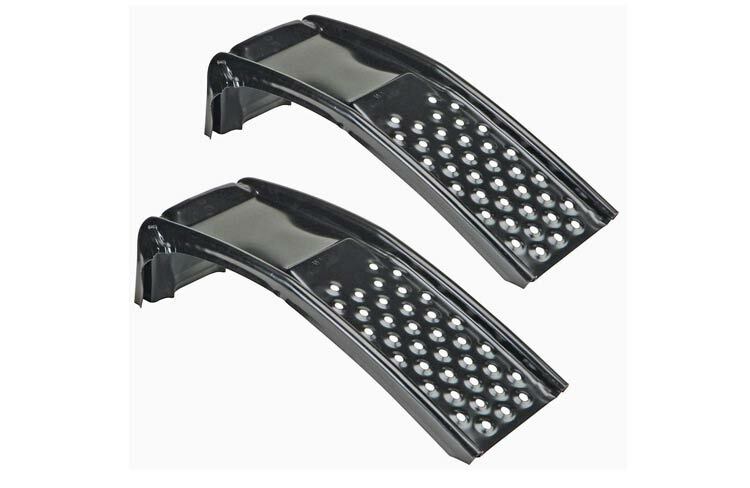 This set has a smooth angle of inclination, so they should not be used on low profile vehicles, as the ridges on the outer edge may rub the car’s underside. The Scepter ramps will allow you to increase the ground clearance by up to six inches and are light enough to carry around. They measure 35 inches long and 9.8 wide, so do not take up much storage space. 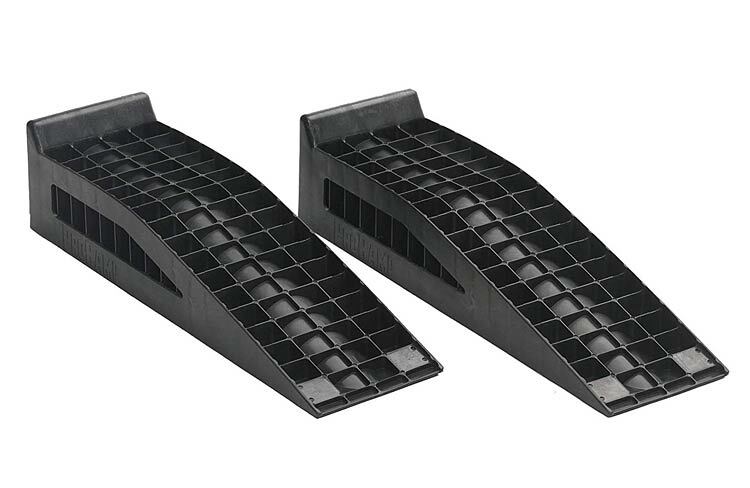 These super affordable twin ramps are designed for leveling trailers and RVs. Finished in eye-catching canary yellow, they will certainly stand out if you use them at the roadside. They can be used to elevate your vehicle to three different heights, hence the name. So, you can raise your trailer three, seven or eight inches, depending on the amount of clearance you need and put it on a more level footing. This will enable the sensors in your black and grey water holding tanks to get an accurate reading and they will allow other appliances, such as the refrigerator to operate more efficiently. They feature a non-slip surface, ensuring your tires remain in place. To start the leveling process, check which side of the vehicle needs to be lifted using the sensors, then place the Tri-Leveler in front or behind the wheel. Then slowly drive onto the ramps, until you reach the desired level. It may be useful to have a helper outside the trailer who can direct you. Then when you are finished, just slowly reverse down the ramps. Constructed from lightweight resin, the Drive-on Tri-levelers are portable enough to carry around with you when not in use and compact enough to stow away in your vehicle. They are easy to operate, as they include built-in handles. Their versatility means they are suitable to be used on most tires. The build quality and durability of this product is assured by the Manufacturer’s One Year Limited Warranty. However, they are one-piece devices, so can only be used on one tire at a time and they are not the best products to make oil changes. 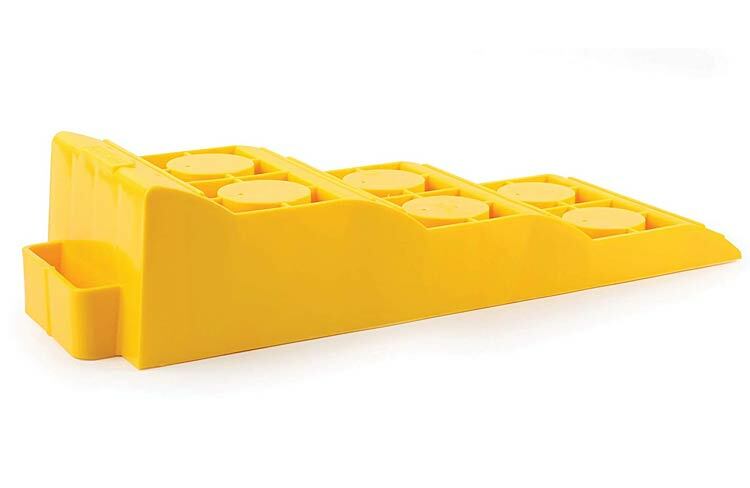 But don’t let that put you off as these leveling blocks are very competitively priced and give great value for money if you just want to complete basic maintenance. This may be a pricier option but it is well worth the extra cost. These are the best ramps for high profile vehicles and are easy to set up and dismantle without using tools. They feature an ingenious four-piece detachable assembly system: first, you position the ramps, then drive onto them, then you set the locking system on each ramp to release the slopes, leaving these pieces to serve as safety tire chocks for other wheels. This all-in-one kit is very convenient, as it is highly portable and frees up much needed storage space. Magnum are one of the leading manufacturers of car parts and accessories and this product is made right here in the USA from tough, environmentally friendly material. What more could you want! As the name suggests, you are getting a good deal here. 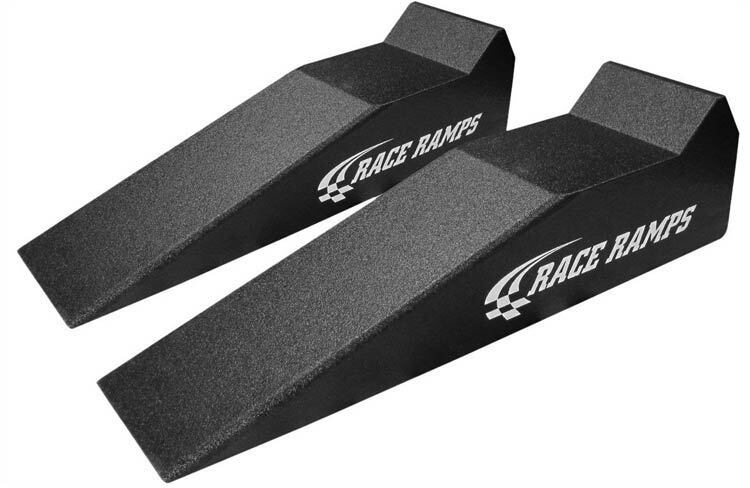 This two piece mini ramp set is designed to increase the ground clearance for low profile cars, allowing you to perform occasional repairs or display your vehicle. They will raise your car 2.5 inches off the ground, which should be sufficient for you to access the underside. You can then fit car jacks under the vehicle and you can lift it up to the height you need. Discount Ramps are not suitable for oil changes but if you own a sports car or rally vehicle, then you can elevate the automobile during winter storage to keep it clean. They are constructed from heavy duty, durable plastic with a honeycomb pattern, which has the combined advantage of deterring long-term moisture build-up and reducing the product’s weight. The ramps are compact with each weighing less than five pounds, making them convenient to carry around with you and to store away. Their integrated wheel grooves work as tire stops, which help to stabilize the vehicle and the non-slip surface provides firm support and reliability. They are suitable for domestic and professional use alike and will save you time and work. Car ramps are essential tools for vehicle repairs and maintenance, as they are reliable and functional. They elevate the front or rear of your vehicle, giving you access to all those hard to reach spots. You need to make sure you take your time and choose the right product, otherwise it may not hold your automobile and it may end up crushing whoever is beneath it. DIY fan? Often work under your car? Then check out our car ramp and car dollies buying guides. Car ramps are becoming increasingly popular as they have many uses and allow you to perform regular checks and repairs. They are stable and simple to use, even for beginners and are lightweight and easy to store. Their price has come down in recent years and they are much safer than using car jacks alone because they offer a large surface area to place your tires and add traction to the ground and support the vehicle’s wheels. They will also save you money on professional mechanics, as you will be able to complete your own basic vehicle maintenance. If used responsibly, they will protect you and your vehicle from harm. So, I hope by following our handy guide, you have been able to choose the right product for you!